Premium-quality micrograin carbide tips are ground on specialized CNC equipment for an extra-fine finish with maximum sharpness and edge retention. 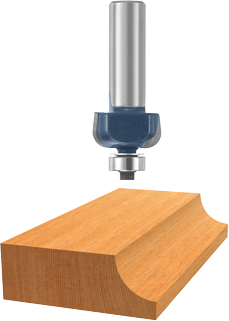 Cove bit creates attractive decorative edging that gives a unique finish to the work piece. The fully hardened and tempered steel shank provides ultimate durability. B. Cutting Edge Length 9/16"
85204M 3/4" 9/16" 1/4" 2" 1/2"
84430M 1-5/8" 11/16" 1/2" 2-1/2" 1/2"
84437M 2" 1" 1/2" 3" 1/2"
84428M 1-1/8" 9/16" 1/2" 2-3/8" 1/2"
84431M 1-3/8" 3/4" 1/2" 2-1/2" 3/8"
85205M 7/8" 9/16" 1/4" 2" 3/8"
85206M 1-1/8" 9/16" 1/4" 2-3/32" 3/8"
85207M 1-3/8" 5/8" 1/4" 2-1/8" 3/8"